An extra lightweight padded collar made of durable nylon. A soft neoprene-padded lining feels comfortable against the dog’s neck, even when the collar is adjusted. 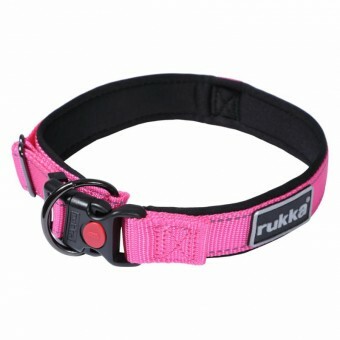 Thanks to its wear comfort and adjustability, the collar is suitable for a growing puppy, too. A buckle closure with a safety lock and a special attachment mechanism to take the pressure away from the buckle and to enhance the collar’s tensile strength. The collar is quick and easy to open. The machine-washable collar has reflective stitching and logo.